NEW DELHI: Global smartphone market leader Samsung is all set to launch its latest Galaxy smartphones at the end of this month and the leaks and rumours about the upcoming smartphones are robust. The latest report comes from GSMArena that cites an insider “who got a chance to play” with the alleged Samsung Galaxy S10e, Galaxy S10 and Galaxy S10+. According to the report, all three smartphones will come with a new Super AMOLED display with support for 10-bit color processing. It is also revealed that that all the handsets will feature a 10MP selfie snapper with OIS, dual pixel autofocus and 4K video. However, the most expensive of them — Samsung Galaxy S10+ — will have an additional depth sensor unit as well. 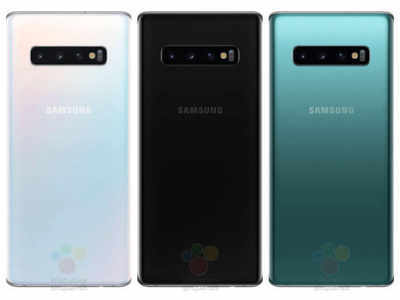 Both Galaxy S10 and S10+ are alleged to come with in-display fingerprint sensor, which the report claims “is faster than conventional in-display scanners.” In terms of colour options, both these two smartphones are said to come in White, Black and Teal with a Vivid Blue option for select markets. These colour options have also been leaked in a report by Winfuture. The third handset, Galaxy S10e, is rumoured to come in an exclusive Vivid Yellow colour option. The report by Winfuture, also reveals that the Galaxy S10e, Galaxy S10 and Galaxy S10+ smartphones will come in 5.8-inch 6.1-inch and 6.4-inch display sizes respectively. To power the handsets, there is said to be 3100mAh, 3400mAh and 4100mAh batteries respectively. As for the price, the report suggests that the Galaxy 10Se, which will come in 6GB RAM and 128GB internal storage variant will cost 749 euros (roughly Rs 60,600); the Galaxy S10 which is said to come in two storage options of 6GB+128GB and 8GB+512GB are likely to cost 899 euros (roughly Rs 72,800) and 1149 euros (roughly Rs 93,000); the Galaxy S10+ is expected to come in three storage variants — 6+128GB, 8+512 GB and 12+1TB and are rumoured to cost 999 euros (roughly Rs 80,000), 1249 euros (roughly Rs 1,01,000) and 1499 euros (roughly Rs 1,21,000) respectively.